What Does 30g of Protein Look Like? We all know that protein is the best macro for any bodybuilder, trainer and athlete. It’s vital for helping us build muscle, lose fat, stay lean, improve recovery and support performance. Studies have shown that 20-30g of protein is all we need to kick start and maximise those important muscle building and recovery processes, with higher serves not providing any further benefit. While most trainers know about this 20-30g principle and also different types of high protein foods, unless you’re strict enough to measure your macros, it’s sometimes hard to figure out just what 30g of protein looks like. This article looks at the some of the most popular high protein foods and how much of each food will give you 30g of protein. 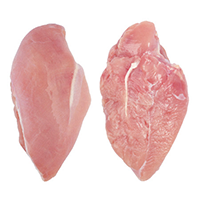 turkey breast can weigh anywhere between 1-2kgs, so adjust accordingly. Steak is delicious and regardless of how you like it cooked, it provides a good punch of tasty protein without the carbs. The fat content will differ depending on how it was fed, the breed and the cut. 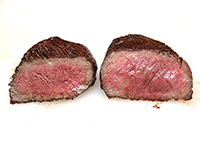 Round cuts (the cuts closest to the rear) are some of the leanest along with Sirloin cuts, but they can dry out quickly, so if you want a juicy steak with these cuts, keep the cooking time low and the doneness to a medium rare and below. The above figures are for a rump steak and also does not include sauces and other additions. Well cooked and well seasoned pork chops are hard to beat. People often think pork is fattier than other meats, but a lean cut of pork compares easily to chicken and beef for providing quality protein often with similar or less fat content. Prepare your pork chops right by brining (soaking in salt water) for at least 30 minutes up to 4 hours. 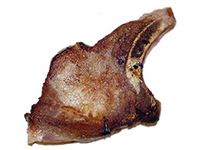 This changes the cell structure of the meat, making for a juicier chop. As this cut is easier to dry, it’s best to sear off the outside quickly with 3 minutes per side and finishing off for about 6-8 minutes in a preheated oven of roughly 200 degrees Celsius. 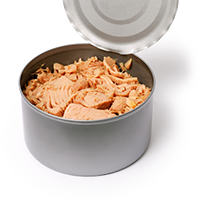 A staple of any serious trainers diet, canned tuna can be pretty bland and boring sometimes, but it’s packed with protein and low in fat and carbs. There are three key types of tuna, Bluefins, Yellowfins and Other. If you have any concern for the future of tuna avoid at all costs Bluefin tuna as most of its species are close to extinction. Yellowfin tunas fare better, but are still not great. When picking your cans of tuna next time, aim for Skipjack tuna or at least make sure that it’s sustainably fished if possible. Grilled baby octopus is not for everyone, but for those who love it, they really love it. 4-5 baby octopus isn’t a lot and I could easily eat 10 or more in one sitting. 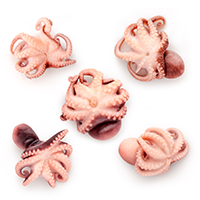 Frozen octopus, which is readily available in supermarkets and seafood retailers have the added benefit of being tenderised by the freezing process. In terms of sustainability, octopus caught locally is extremely sustainable. Poached, scrambled, fried and hardboiled. Just some of the many delicious ways you can prepare the white and gold orbs. 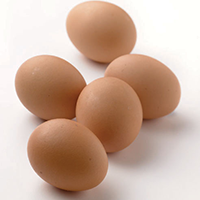 One of the best sources of protein around, you do have to be wary about the fat content, which can be quite high, especially if you’re planning to do multiple eggs a day. While there is no nutritional benefit of having free range vs caged eggs, if you’ve ever seen battery hen practices, you’ll think twice about buying caged eggs. 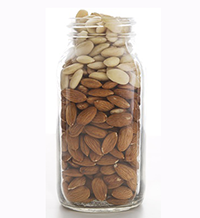 Nuts are often recommended as good sources of healthy fats and protein with almonds being one of the most popular choices. Looking at the figures above though, you wouldn’t want to rely on almonds for your protein needs unless of course you were bulking. While raw bitter almonds can be toxic, the whole kernels that are available in the supermarkets are of the sweet variety. Nothing is quite like the sticky, salty, sweet taste of peanut butter. It’s delicious with toast, in shakes, with celery or just by itself. As with all nuts and nut products, it’s higher in fat than anything else, but most of it is unsaturated. A lot of people like to buy the unsalted varieties, but they often contain added sugar as a result. 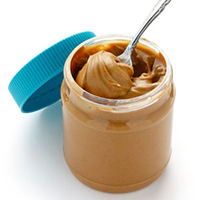 Interesting fact – it takes about 550 peanuts to make a small jar (340g) of peanut butter. Another bodybuilder’s staple, cottage cheese is a mild flavoured curd product which has is lauded for its low amount of calories per serve, but high protein content. Most cottage cheeses though often also contain plenty of salt, so it’s best to find reduced sodium varieties if possible. 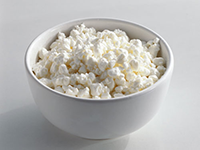 Cottage cheese is made up mostly of casein proteins, making it an ideal before bed snack, but can be consumed throughout the day to provide a sustained release of amino acids for your muscles. Thick and sour Greek yogurts tend to contain twice the amount of protein than other mainstream yogurts. This has skyrocketed its popularity in recent times, especially among active and more health conscious individuals. As with cottage cheese, Greek yoghurt is mostly made of casein protein as it has been strained of the majority of its whey content. The term yogurt or yoghurt is actually derived from a Turkish word, but the origins of yogurt may be from a dairy product known as Oxygala in Ancient Greece. If you want to get your protein from yoghurt, but don’t want to expand your waistlines, try getting a lower fat variety. Most of us can’t imagine a world without cow juice. After all, what would we eat our cereal or biscuits with? But it is one of the more convenient sources of protein around. After all, it is the base ingredient of our revered protein powders and protein bars. Skim milk is higher in protein than full fat milk, simply due to the fact that much of the fat has been processed away. However, there’s really nothing wrong with having full fat dairy as studies have shown no stronger correlations than skim products for cardiovascular disease and in fact, those who drink full fat dairy actually have smaller waistlines. Tofu is a pretty divisive protein. 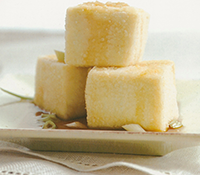 Not only for its texture and taste, but also for the fact that it’s made from soy. While many trainers still hold onto the idea that soy someone increases estrogen and lowers testosterone, the science has definitely busted that notion. In fact, research has shown that soy and dairy protein blends are better than whey protein alone for sustaining longer amino acid transport to the muscles. Because of its mild taste, this protein is extremely versatile and can be used in a similar fashion to cottage cheese in both savoury and sweet dishes, but with less sodium. Eating enough beans to give you 30g of protein will probably make you the most musical of the office; but if you’re okay with that, legumes such as beans are low in fat, high in fibre and complex carbohydrates as well as protein. If you’re wondering what a legume is, these includes beans, peas, lentils and even the humble peanut. Most raw legumes require a decent amount of processing and soaking before being ready to eat. Quinoa’s popularity as a health food has risen rapidly since 2006, which has effectively meant a tripling in price of its value. It’s a very hardy grain that can be grown in arid conditions and is one of the higher protein carbohydrate sources around. While it is an excellent high protein choice for vegans and vegetarians, it’s important to acknowledge the extent to which its popularity and increased value has increased poverty in the common regions where it’s grown such as Peru and Bolivia. 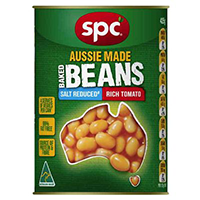 If possible, try to buy Aussie grown and make sure you have plenty of other grains as well. Protein as a macronutrient is rising in popularity by the minute. These days, everything is high protein or advertised with added protein. It’s a nutrient that has all the benefits without many of the pitfalls of excess carbohydrates or fats. As a trainer or anyone wanting to improve their body composition, 20-30g of protein is ideal for helping to kick start muscle repair and growth processes, which can support a healthy metabolism and support training and performance. With the list above, you now have a quick guide on just how to get those 20-30g of protein from your foods, but you just can’t beat a good protein powder as the most convenient and densest source of protein around. 1. Moore DR, Robinson MJ, Fry JL, Tang JE, Glover EI, Wilkinson SB, Prior T, Tarnopolsky MA, Phillips SM. ‘Ingested protein dose response of muscle and albumin protein synthesis after resistance exercise in young men.’ Am J Clin Nutr. 2009 Jan;89(1):161-8. 2. Symons TB, Sheffield-Moore M, Wolfe RR, Paddon-Jones D. ‘A moderate serving of high-quality protein maximally stimulates skeletal muscle protein synthesis in young and elderly subjects.’ J Am Diet Assoc. 2009 Sep;109(9):1582-6. 3. Kratz M, Baars T, Guyenet S. ‘The relationship between high-fat dairy consumption and obesity, cardiovascular, and metabolic disease.’ Eur J Nutr. 2013 Feb;52(1):1-24. 4. Reidy PT, Walker DK, Dickinson JM, Gundermann DM, Drummond MJ, Timmerman KL, Cope MB, Mukherjea R, Jennings K, Volpi E, Rasmussen BB. ‘Soy-dairy protein blend and whey protein ingestion after resistance exercise increases amino acid transport and transporter expression in human skeletal muscle.’ J Appl Physiol (1985). 2014 Jun 1;116(11):1353-64.